The CD85 is used primarily for the anchoring of dowel bars as those used in the construction of highways and airport runways and taxiways. It is also used for the bonding of highway pavement markers. The CD85 is ideal for anchoring because a shot-sizing feature enables the operator to select and repeat an ideal resin dosage, Once set, the precise dosage is repeated time after time. 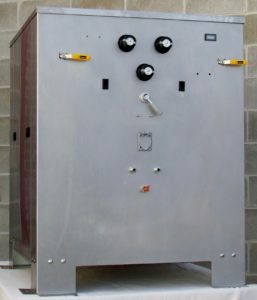 Two bulk hoppers, transfer pumps, and the metering assembly are all located in one cabinet. A Flow Management Kit adds the Remote Trigger Assembly and the Twin Shut-off Valve for a simple remote controlled delivery of metered and mixed epoxy resin. Using plastic disposable mixers, clean-up is nothing more than removing the disposable mixer from the Twin Shuf-off valve and disposing of it.